Upon your admission that you've never seen Logan's Run, a friend or family member may turn to you and say: "You've never seen Logan's Run? What do you mean, you've never seen Logan's Run?" It's that sort of movie. Considered a classic of science fiction by some, this rather silly 1976 schlock-fest represents the dying gasps of big budget sci-fi movies with pre-Industrial-Light-&-Magic grade special effects. With Star Wars arriving the next year, that's not really much of a surprise. 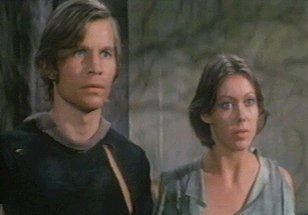 Michael York as Logan 5, and Jenny Agutter as Jessica 6. Like The Time Machine and Planet of the Apes before it, Logan's Run is filmed in that washed-out movie stock we've all come to associate with the late sixties and early seventies. (See The Invincible Six for more on sixties' film processes.) It also shares much of the same imagery: familiar landmarks abandoned and grown over, naive inhabitants of a post-apocalyptic world dressed in loose clothing, and an intrepid, square-jawed hero in search of the truth. The makers of these mid-twentieth-century sci-fi epics were apparently reading out of the same movie-making book. Not that this is an uncommon trend in filmmaking; many a Hollywood executive has been heard to exclaim the equivalent of: "Wow, Film Concept X worked once? Let's make more films similar to it until we've milked Concept X dry and flooded the market with mediocre movies!" This is why 70% of all the movies in the theater over the next couple of months will involve volcanoes, floods, or ships sinking. Or really strong winds. Logan's Run, however, is probably the last of the films in the "Shattered Earth" sub-genre worth watching. Later movies with this approach include the unwatchable Empire of the Ants (1977) and the awful remake of Invasion of the Body Snatchers (1978). Clearly, Star Wars and its computer-enhanced, space-opera brethren (Buck Rogers in the 25th Century, Battlestar Galactica) had captured the high ground and high budgets, making the Planet of the Apes formula obselete. Logan's Run is the last example of this sort of picture that retains even the smallest shred of dignity. The title character, Logan 5, is a citizen of the City, a domed habitat that looks suspiciously like a shopping mall. (Much of the movie was, in fact, filmed in a shopping mall. All the 'help wanted' signs probably should have tipped us off.) Following the Catastrophe, the architects of the City (You can make normal words sound futurisitic by capitalizing them. Try it!) imposed a strict limit on the lifespans of its citizens: they may not live past the age of thirty. To enforce this rule, each person is implanted with a "lifeclock," a crystal that changes colors during different periods of his life. Defying all fashion sense, members of each age group wear the color which corresponds to their crystal. Young people are Yellows, teens and early twenties are Greens, and late twenties are Reds. When you reach your 30th birthday, or "lastday," your red crystal begins to blink and you are forced to ride the Carousel, a kind of roller coaster of doom. Although the Carousel ritual promises some vague hope of continued life through Renewal, some people try to escape the city when they reach their lastday. Dubbed "runners" (and we're not even close to being finished with the Logan's Run vocabulary), these erstwhile escapees are hunted down by a special corps of Sandmen, who, although they are subject to the same lifeclock rules, wear black and take great joy in terminating their less fortunate neighbors. Logan 5 is a Sandman who is assigned a special mission: he must find the rumored Sanctuary, a place to where a supposed 1056 runners have escaped. To help him do this, his lifeclock is accelerated to the blinking stage and he must pose as a runner. The computer voice which assigns him the mission, however, refuses to answer his questions about Renewal. Logan begins to suspect that the Carousel is more final a death than it is purported to be. After hooking up with Jessica 6, a member of the underground movement which helps runners, Logan finds himself on the run for real. Casting aside his Sandman heritage, Logan and Jessica flee the City, hoping to find Sanctuary. Michael York makes a pretty good Logan, even if they did have to alter the story from the original novel in order to match his age. He is convincingly naive at first, and his realization of the truth is well played. His pleas with the other members of the City to cast aside the Carousel ritual are a bit overplayed, but that's certainly in keeping with the tradition that Charlton Heston set before him ("You bastards! You finally did it!") in Planet of the Apes. Jenny Agutter is a wonderfully waifish Jessica 6; her character tirelessly plods after Logan, whining only occasionally about being tired or scared. Contrast that to Farrah Fawcett's character Holly, who ends her brief part in the film with mascara running down her face in pathetic streaks. Peter Ustinov adds a bit of humor to the film with his "sweet madman" who appears after Logan and Jessica have finally escaped the City. Despite the fact that the film drags horribly in the final forty minutes, the ending is remarkable in that it's actually subtle. There are no lengthy explanations or intrusive voice-overs, merely a wordless scene with some heartfelt acting. Kudos to director Michael Anderson Sr for saving this movie at the last moment. 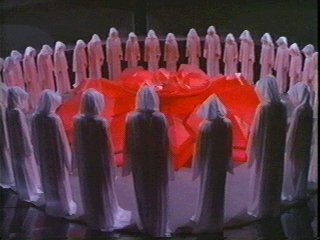 William F. Nolan, one of the original authors of the novel Logan's Run, has expressed interest in remaking Logan's Run with a big budget and modern special effects. He claims that the technology now exists to make a film closer to his original vision. While that may be true, we doubt that any remake could capture the charm evident in this orphaned child of a dying Hollywood formula. Logan's Run Special Edition, anyone?